Directly translated from Japanese, the name of this temple is “Pure Water Temple” and it is one of the country’s best known temples. Originally founded in 780, the name of this structure comes from the Otowa Waterfall with which it shares a site in the hills to the east of Kyoto. 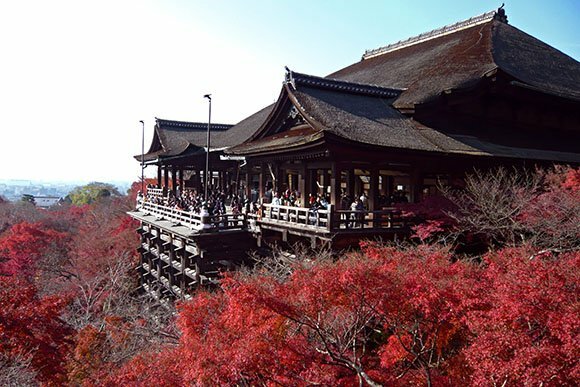 A UNESCO World Heritage Site since 1994, the Kiyomizu-dera Temple is famous for its wooden viewing platform which stands 13m over the hills and their maple and cherry trees which provide a stunning visual display during the fall and spring time. The main hall is home to the thousand-armed, eleven-faced Kannon, an object of worship, while the Jishu Shrine behind the hall is dedicated to the god of love. If visitors can find their way from one of the stones outside the shrine to the other, 18m away, they will be lucky in love. Visitors can drink from one of the three streams of the Otowa Waterfall using a cup attached to a long pole, and can choose whether they want to benefit from a lucky love life, a long life or academic success, while pregnant women will want to visit the Koyasu Pagoda in the grounds for a safe childbirth. Tourists enjoy soaking up the atmosphere of the Higashiyama District around the temple with its many restaurants and shops as well as enjoying the evening illuminations during special seasons.